Leann Geerts, OD, FAAO is an optometrist who suffered from eye problems at an early age. Dr. Geerts had strabismus (lazy eye) that required surgery on both of her eyes as a young child. Growing up in Michigan and Pennsylvania, optometry was familiar as far back as she can remember. She received her Bachelor of Science degree from The Pennsylvania State University in 1993 in General Science. She received her Doctor of Optometry degree at Indiana University in 1998. She then completed a hospital-based ocular disease residency at the Baltimore VA Medical Center in Maryland. Dr. Geerts has been in practice since 1999 when she moved to South Carolina. Her work in the Greenville/Spartanburg area included private practice optometry, working alongside a general Ophthalmologist, and also being Clinical Director of TLC Laser Eye Centers in Greenville. Dr. Geerts moved to Wilmington in 2007 and worked with a local group optometry practice before joining Wilmington Eye in February 2013. She does a wide range of primary care optometry including contact lenses, glaucoma and diabetic management, and pre- and post-operative LASIK and cataract care. 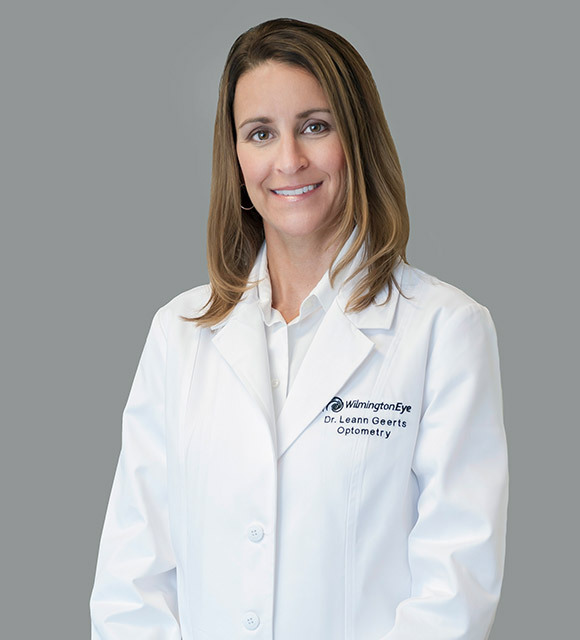 Dr. Geerts is a current member of the American Optometric Association, North Carolina State Optometric Society and has been a Fellow of the American Academy of Optometry since 2004. She has lectured to doctors and delivered public patient seminars during her time at TLC as she very much enjoys educating patients about eye care. Her current state licenses to practice optometry include North Carolina, South Carolina and Virginia. Outside of work, Dr. Geerts enjoys her family time with husband, Kevin, and their two boys. She enjoys volunteering at her son’s school, exercising, scuba diving, boating, traveling and listening to music. Dr. Geerts sees patients at our Hampstead location.